Overview: “You have to be born a king or a madman to do what you want.” For King Tease, it would seem that this is not a problem – for it’s quite possible that he is both. For he decided that this world had far too high a number of monarchs and that only one should remain: him! And so he’s sending out his Hand to slay all other rulers, to walk through forests, deserts, and green pastures, as well as volcanoes and cemeteries, in exchange for gold and glory but, more often than not, all they receive in return is… death and setbacks. You, the King’s Hand, should recruit a small group of fighters from twelve character classes: There are so many heroes to serve as cannon fodder for His Majesty’s pleasure! 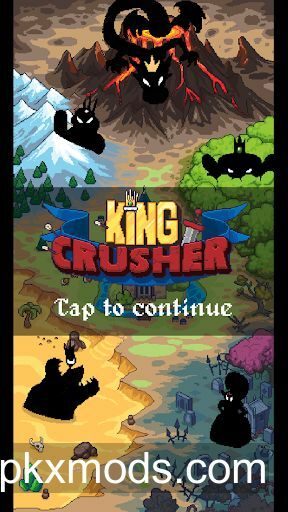 Take advantage of everyone’s strengths, move strategically on the field, collect all the items you find on your journey, put the bonuses you pick up in combat to good use and level up in this great adventure with its wacky and offbeat humor. Dive on rogue-like and RPG game in an original way. Its dynamic gameplay is based on swipes and cleverly carried-out quick hits to attack, defend, and move using press/slide motions on the characters that make up the King’s Hand.